That describes my life right now. It seems I just go from one project to the next and never seem to get caught up. I'm guessing everyone else is the same way but I'm ready for life to slow down a little bit. I haven't had time to work on anything for the blog. Between Christmas projects and club projects, there hasn't been any free stamping time. So, I'm going to share some projects that my stamp club members will be doing this coming Saturday. Sorry ladies if you are reading the blog. I normally don't post club projects until after club, but I'm making an exception as I wouldn't have anything to post this week if I didn't. This first card is one I really love. I love glitter for the holidays, I mean honestly who doesn't? This card uses Heat and Stick powder and Dazzling Diamonds glitter. It also uses the Holiday Lineup stamp set which I just adore. Here's the project and all the info, as always all supplies from Stampin' Up! I apoligize that the picture isn't better, since it was raining today, I had to shoot indoors which I don't like to do and I kept getting a glare on the glitter! I chose to do a totally monochromatic scheme for this card and love the way it turned out. While I love lots of colors on cards, for some reason this one just screamed monochromatic to me. Hope the ladies like it, I do! Oooh! I just got this set and this very DSP (I am so behind!). I love what you did here and am of to CASE away! I think it's gorgeous! 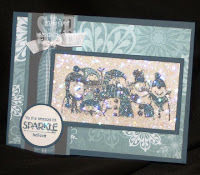 Gives that snowman stamp a whole different look than anybody else has done! Great job. I have to admit that I did not like this set at all until I saw what everyone has done with it. This is beautiful and I love all the glitter!! Pretty card! !